A large number of Glastonbury festival-goers have reacted negatively to the news of Kanye West headlining this year's event. Remember back in 2008 when British music fans (including the perpetually grouchy Noel Gallagher) got their knickers in a bunch because Jay Z was headlining Glastonbury? There was an outcry over Jay being the first rapper to headline Glastonbury, apparently because he wasn't "rock" enough to handle the top slot on the bill. Well, it's 2008 all over again. Glastonbury booked Kanye West to headline the festival's Saturday lineup, and fans are already demanding that Yeezus be dumped from the lineup. According to a Change.org petition signed by more than 30,000 people, it's because "Kanye West is an insult to music fans all over the world" and not "deserving." Why isn't Kanye good enough for Glastonbury? The reason, of course, is rock elitism. 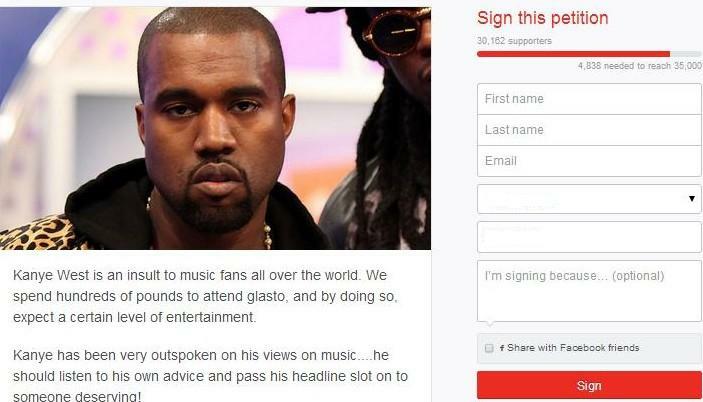 "Cancel Kanye West's slot and get a rock band," the petition demands, adding, "We spend hundreds of pounds to attend glasto, and by doing so, expect a certain level of entertainment." For the record, Foo Fighters are headlining Friday night's Glastonbury lineup. It's hard to imagine an American rock-fest audience having the same existential panic over the prospect of having to watch a rapper one evening, but apparently things are different for the Glastonbury faithful. It is, however, worth noting that anyone on the Internet can sign this petition, regardless of whether they're going to Glastonbury or even live in the U.K. So these 30,000-and-counting signatures don't exclusively come from Glastonbury fest-goers.